A recent court ruling shows that law enforcement officials can require you to use Touch ID to unlock your iPhone or iPad. 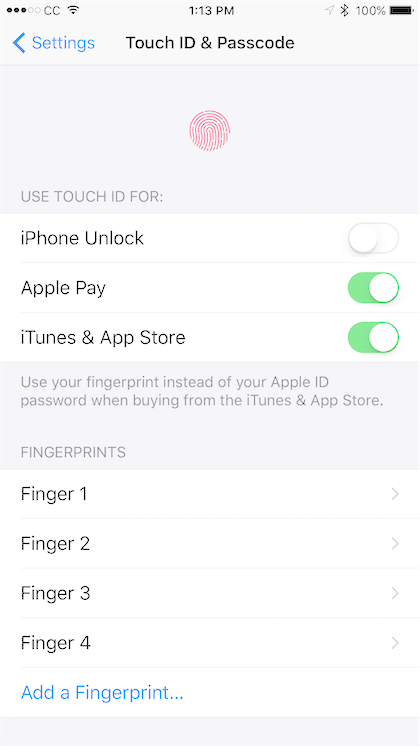 So here’s how you can stick it to the man by disabling Touch ID. Newer technologies can sometimes race far ahead of laws and law enforcement officials, but eventually the government catches up. So it has proven to be true with Touch ID, one of Apple’s best features on the iPhone and iPad. A court recently ruled that a convicted felon had to unlock her iPhone with her fingerprint. A fingerprint, unlike a passcode, is currently not considered to be protected under the Fifth Amendment. So if you are worried about being forced to unlock your iPhone with Touch ID by law enforcement officials, a logical response would be to simply turn off Touch ID altogether. 3. Type in your passcode. 4. Toggle the Use Touch ID switch for iPhone (or iPad) Unlock to the off position. Now your iOS device cannot be unlocked using Touch ID. The only way to unlock it is with your passcode. And currently it appears that, under the Fifth Amendment, you cannot be legally forced to use your passcode to unlock your iOS device. So disabling Touch ID can help protect your privacy from being violated by law enforcement officials. I haven’t switched off Touch ID on any of my iOS devices. Yes, it’s probably a good precaution. But I don’t anticipate having any problems with law enforcement in the short term. I lead a rather routine-oriented life that doesn’t lend itself well toward breaking the law and drawing the ire of courts and cops. But If I were going to travel to another country or otherwise put myself into a situation where law enforcement officials might try to compel me to unlock my iPhone, I’d make sure to disable Touch ID before I left the house. You know what they say about an ounce of prevention being worth a pound of cure.